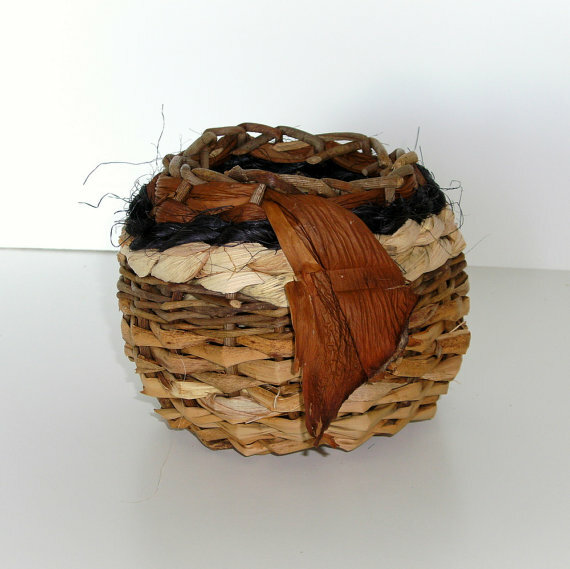 I created this freeform basket (I don’t use molds) with a lot of earthy brown elements I have collected. Some are purchased; most I have gathered. The base is woven with vine rattan. Added from bottom up are bullrushes, more vine rattan, corn husks, hand-dyed sisal baling twine, and at the top a philodendron sheath. I like the way the basket is not perfectly symmetrical; it has its own natural personality. Add dried flowers, or insert a glass or vase and now you have a wonderful way to display fresh flowers. Place this basket atop your dresser, in your guest bath, on the mantle, or even on your desk at the office. The natural ambience will bring a sense of the outdoors and add a touch of the regenerating freshness of nature.